There are times when I’ll wax poetic about a booze. There are times when I won’t. There are times when I’ll ramble on and on about a booze. And there are times when I won’t. Slaughter House is warm, sweet, and full of flavor. I could ramble on and on about how awesome this whiskey is. Hey, and it’s not even Bourbon. But I’m going to refrain from all that and just say: Slaughter House is fantastic. Personally, I’m all for whiskey being aged for 9 years in American Oak barrels. I think that’s great! But then, Dave Phinney (of Orin Swift and Splinter Group) decided it’d be a good idea to then further age the whiskey in Papillon barrels. And I’ve decided that Dave Phinney is a genius. You don’t know, because I don’t talk about it up here, but I’m a fan of wine. I review wines over at Delectable. I’m a fan of Orin Swift wines. There. I said it. Anyway, the touch of wine present in Slaughter House is excellent. But I’m getting ahead of myself. Let’s talk about the nose. Butterscotch. Oh so much glorious butterscotch. The burnt sugar reminds me of créme brulee, just without the creaminess. There’s a hint of vanilla in the scent as well. The biscuit notes are mainly toast and baking soda, but they’re nice touches. The flavors all match up with the nose, but with the added bonus of black cherry. Oh it’s glorious. It’s just a hint, but it’s fantastic. It’s almost like a pre-mixed cocktail. …I’ve decided that Dave Phinney is a genius. 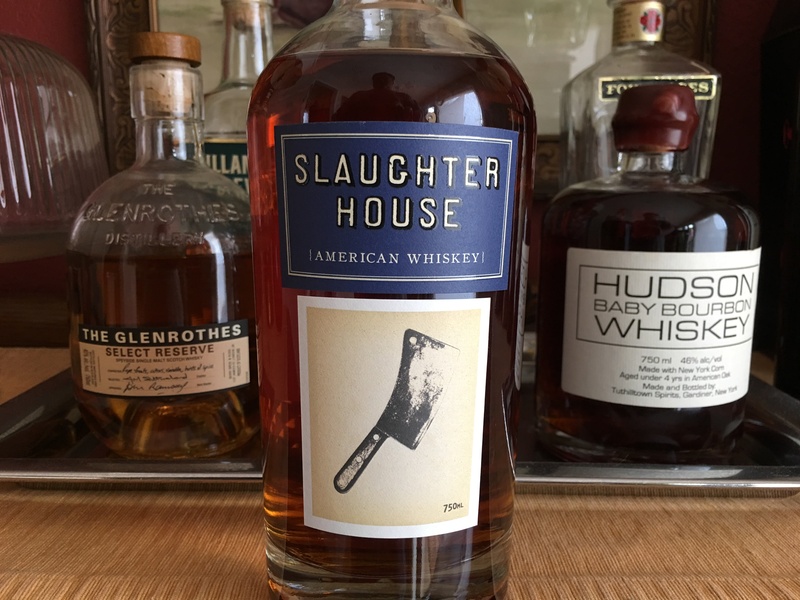 Slaughter House is a fantastic whiskey with layers of flavor and a long warm finish.